"Over the last few years, I used several detox therapies along with a nourishing diet to help my body recover from Hashimoto’s disease. One of my favorites is a castor oil pack. It’s relaxing and very easy to do – how can you pass up watching your favorite movie while detoxing? “Lymphocytes are your immune system’s disease-fighting cells and are produced and stored mainly in your lymphatic tissue (thymus gland, spleen, and lymph nodes). Hundreds of miles of lymphatic tubules allow waste to be collected from your tissues and transported to your blood for elimination, a process referred to as lymphatic drainage. When your lymphatic system is not working properly, waste and toxins can build up and make you sick. A castor oil pack is very easy and only requires a few supplies. The castor oil and wool flannel last for many, many months, so don’t worry about running out any time soon. 1. Place the piece of flannel in a large dish. 2. Drizzle castor oil over the flannel until it’s saturated. 3. Plug in the heating pad next to your bed and turn it on to medium. 4. Set the dish with the flannel, the ziploc bag, and old towel on your nightstand or next to the bed. 5. Lie down and place the wool flannel on the right side of your abdomen, directly against your skin (it will cover some of your stomach also). 6. Put the ziploc bag on top of the flannel. 8. Place the old towel on top of the heating pad. 9. Lie down for 1-2 hours, remove and wipe your abdomen with the old towel. For more information on the specifics of doing a castor oil pack click here. That’s it! Not so difficult, right? Next week I’ll discuss the importance of detoxing and why it’s necessary even with the most perfect diet. Disclaimer: This information is not intended to take the place of the advice and council from your doctor. Always seek the advice of a health professional for medical advice. Posts may contain affiliate links. If you purchase a product through an affiliate link, your costs will be the same but Deliciously Organic will receive a small commission. This helps cover some of the costs for this site. We appreciate your support!" Much to my dismay, after 3 days of pain this past week followed a suspicious rash, I was told by the doctor that I have shingles!!! Ugh!!! The timing couldn't be worse as we were supposed to leave two days later for sun and fun after our recent polar vortex this past winter. "In many ways, castor oil is a very unique substance. 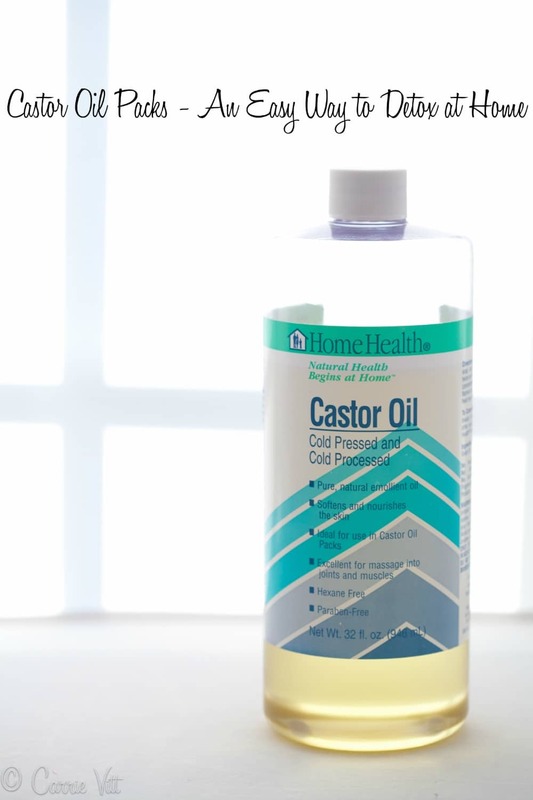 While most of us are familiar with its use as a remedy for constipation, folk healers in this country and around the world have used castor oil to treat a wide variety of conditions. Its effectiveness is probably due in part to its peculiar chemical composition. Castor oil is a triglyceride of fatty acids. Almost 90 percent of its fatty acid content consists of ricinoleic acid. To my knowledge, ricinoleic acid is not found in any other substance except castor oil. Such a high concentration of this unusual, unsaturated fatty acid is thought to be responsible for castor oil's remarkable healing abilities. Castor oil's antimicrobial activity, while very impressive, comprises only a small part of the story concerning this mysterious oil. While castor oil has been thoroughly investigated for its industrial uses, only a minimal amount of research effort has been directed toward its medicinal benefits. The most exciting use deals with ways to increase topical absorption through the use of castor oil packs or poultices. Much of the current use of castor oil packs, in the U.S. anyway, can be attributed to the late Edgar Cayce. Time after time he recommended their use. Based on his reports, I began to use them in my practice over 12 years ago. But even though I, and numerous other doctors, have continued to experience remarkable results, the technique is still practically unknown and shunned by most health care professionals today. This is probably due to two reasons. First, it's just too simple. It's hard for most people to imagine that something as simple as castor oil packs could have a profound effect on any health problem. Secondly, in our present health care system, positive results alone do not constitute the critical factor in determining whether a treatment will be accepted by the medical establishment. [Everybody (except probably the poor patient) now seems to be more concerned about how something is supposed to work, than whether it actually works at all.] Recent research data presented by longtime follower of Edgar Cayce, Dr. William McGarey of Phoenix, Arizona, might help shed some light on how castor oil works. McGarey has reported that, when used properly, castor oil packs improve the function of the thymus gland and other areas of the immune system. More specifically, he found in two separate studies that patients using abdominal castor oil packs had significant increases in the production of lymphocytes compared to increases among those using placebo packs. Lymphocytes are the disease-fighting cells of your immune system. They are produced and housed mainly in your lymphatic tissue. This includes the thymus gland, the spleen, the lymph nodes and the lymphatic tissue that lines the small intestine (called Peyer's patches, or more commonly, aggregated lymphatic follicles). Strangely, other than knowing it produces the body's white blood cells, most doctors are not very knowledgeable about the lymphatic system. The lymphatic system is an amazingly complex structure. It works hand in hand with both the blood circulatory system and the digestive system. In the circulatory system newly oxygenated blood from the lungs moves from the heart along smaller and smaller arteries until it reaches the smallest vessels called capillaries. It is in these microscopic tubules that the blood exchanges oxygen and nutrients for cellular waste products with surrounding body cells. The capillaries then gradually become larger and form veins through which the unoxygenated, waste-carrying blood returns back to the lungs and then to the heart to be recirculated time and time again. Also, along these lymphatic tubules you'll find bulb-shaped masses called lymph nodes, which act as filters and produce antibodies when foreign proteins are encountered. I'm sure you've experienced the tenderness and swelling of an inflamed lymph node at one time or another. It is usually a result of antibodies fighting an infection either in the node itself or somewhere in the draining area of that particular lymph chain. In addition to returning leaking fluid from the circulation system and creating antibodies for the immune system, the lymphatic system also performs another very important function. Clumps of lymphatic tissue, called Peyer's patches, are spread throughout the small intestine. Unlike other nutrients, fat molecules are generally too large to be absorbed directly from the intestine. Instead, they are absorbed by these patches and transported along the lymphatic system and then released into the blood stream where they can be carried throughout the body. Between 80 to 90 percent of all the fat absorbed from the gut requires the help of the lymphatic system. When it comes to treating the majority of health problems, the status of your lymphatic system is rarely given any consideration whatsoever. Medical students are taught that a failure of the lymphatic system is obvious to detect because it is accompanied by "pitting" edema (the accumulation of fluid in the tissues, i.e. swelling, usually in the feet, ankles or hands). The test for "pitting" edema is rather simple. A finger is pressed into the skin at the area of the swelling and then quickly removed. The skin stays depressed, forming a small "pit", which remains until the fluid outside the cells has time to return to the area (this can take anywhere from 5 to 30 seconds). Unfortunately, research studies have shown that "pitting" edema and other signs of fluid retention can't be observed until fluid levels outside the cells reach 30 percent above normal. In other words, you can have a serious lymphatic drainage problem long before it can be detected. Several problems occur when the lymph drainage slows and fluids begin to accumulate around the cells. First, the individual cells are forced further and further away from the capillaries. The amount of oxygen and nourishment they receive is decreased. Under exertion or stress some cells may die. Additionally, cells are forced to survive in their own waste and toxic by-products. This situation can eventually lead to the degeneration and destruction of organs. For example, poor lymphatic drainage of the heart can lead to tissue damage and even heart failure. Similar problems occur in the liver, the kidneys and other organs. A good analogy would be if you confined yourself to one room of your house. Someone could bring you food and water, but not remove any of your waste products. Eventually you would have difficulty remaining healthy in such an environment. As your waste accumulated, not only would you become sick, those around you would begin to experience the same fate. Just like it is for each cell, in addition to nourishment and oxygen, the removal of waste products is essential for continued health of the entire body. Fluid accumulation outside the cells also stretches the tissue in the area. The more it stretches and the longer it remains that way, the harder it becomes to correct the problem. Efforts should be taken to improve the function of the lymphatic system in every health problem. This applies to AIDS, as well as heart disease, hemorrhoids and everything in between. No drug exists that has the ability to improve lymphatic flow; however, the job can easily be handled through the topical application of castor oil. When castor oil is absorbed through the skin, several extraordinary events take place. The lymphocyte count of the blood increases. This is a result of a positive influence on the thymus gland and/or lymphatic tissue. The flow of lymph increases throughout the body. This speeds up the removal of toxins surrounding the cells and reduces the size of swollen lymph nodes. The end result is a general overall improvement in organ function with a lessening of fatigue and depression. As toxicity is reduced, the pH of the saliva becomes less acidic, indicating improved health. The Peyer's patches in the small intestine become more efficient in their absorption of fatty acids, which are essential for the formation of hormones and other components necessary for growth and repair. The most common way to use castor oil (and most objectionable, I might add) has been to take it orally. Generally, oral doses are used to correct constipation. The recommended dose is usually 1 tablespoon for adults and 1 teaspoon for children. You can usually expect a "purging" of the system in about four to six hours. To make a castor oil pack you will need the following items: cold pressed castor oil, a standard heating pad, a plastic garbage bag, two or three one-foot square pieces of wool or cotton flannel and one large bath towel. 1. Start by placing the heating pad on a flat surface and turn the setting to high. 2. On top of the pad lay the plastic garbage bag. Next, soak the flannel pieces with castor oil generally about 1/2 cup) and lay them on top of the garbage bag and heating pad. 3. The entire pack can now be placed against the body with the oil-soaked flannel on the skin. For general conditions the pack should be placed on the abdomen. (For treating lower back problems, the pack can be placed there.) To help hold the pack in place and to keep oil from getting on bedding, etc., the body can be wrapped in a large bath towel. 4. The pack should remain in place for at least one hour and the temperature of the heating pad should be kept at the highest temperature tolerable to the patient. 5. When you remove the pack, the remaining oil can be massaged into the skin or cleaned off using a little soda water made from 1 quart of warm water and 2 tablespoons of baking soda. Due to the many effects of its fatty acid component, ricinoleic acid, the use of castor oil can be used topically to treat a wide variety of health complaints. 1. nerve inflammations such as sciatica, shingles, etc. Conditions that stress or compromise the immune system will very often benefit from castor oil packs. Nowhere is this more obvious than with AIDS. I have talked with several AIDS patients who have added castor oil packs (usually for one hour a day) to their treatment regimen with very positive results. Within two weeks, it was not uncommon for them to see increases in their WBC counts (white blood cell counts), platelet counts, hematocrit readings and RBC counts (red blood cells). The blended material is then strained through a wire strainer to remove the pulp, which is discarded. The remaining liquid is divided in four equal portions of approximately 1/4 cup each and a portion is consumed with each of the three daily meals and before bedtime. In addition to stimulating lymphatic flow, the drink increases the flow of bile from the liver and gallbladder, which, in turn, enhances one's ability to digest essential fatty acids through the Peyer's patches in the small intestine. It is not uncommon for AIDS patients to experience weight gain and a reversal of a long list of complaints often associated with fatty acid deficiencies. Any oil that enters your body either orally or through the skin needs to be of the highest quality. Castor oil is no different. Check your local health food store for cold-pressed castor oil. If you can't find it there or they can't order it for you, then it can be ordered through the mail from Heritage Store, P.O. Box 444, Virginia Beach, Virginia 23458. They can also be reached by calling 1(800)862-2923. In his readings, Cayce attributed several actions to castor oil. Most were in one way or another related to the body's lymphatic system. However, he also alluded to the idea that castor oil has a vibrational quality that helps harmonize and promote healing within body cells. Based on statements like these, many people labeled his psychic readings as quackery. As we gain new knowledge about the workings of the human body, however, these explanations don't seem so far fetched. Dr. Johanna Budwig has related much of the healing properties of flax oil to its unique chemical bonds that vibrate at the same frequency as the wavelengths of sunlight. She feels the essential fatty acids in flax oil have the ability to absorb and store the energy from sunlight. It's possible that the special bonding in castor oil's unique ricinoleic acid works in a somewhat related method. Regardless of exactly how it works, I think you'll be more than satisfied when you experience the amazing feats that can be accomplished with the simple oil of the castor bean. Centuries ago the castor bean plant was referred to as the "Palma Christe." It was called this because the shape of the plant's leaves were thought to resemble the palm of Christ. Knowing the healing power of this plant, the name may be one of the most accurate descriptions ever."